Events are meant to be fun. It’s hard to think that if something were to go wrong, such as a guest getting injured or property getting damaged, that there would be serious legal, financial and reputational implications. Due to the potential severity of these repercussions, it is important to factor in event security as a part of your event planning process. We have provided tips and best practices for creating and executing tight event security. When you begin to think about security for your event, consider the scope of your event and the scope of security needed to match it. Think about your venue. Each venue will need a security plan specific to that site. For example, your approach to security would be different for an outdoor venue opposed to an indoor event. An important step in this process is knowing what the regulations and rules are for the venue. Will you be allowed to bring equipment in and store it during a multi-day event? Are there areas that guests are forbidden to enter or exit? What is the policy around bringing in personal food or beverages? The first and most critical place to start at this step is with the entry and exit points. Alongside determining where the official entry and exit points are, ensure you identify potential places where people may be able to enter. This might be an emergency door or a window with a broken lock. Pay close attention to areas that are expected to have high traffic and consider ways to reduce the chances of a bottleneck building. Create a diagram of the venue with the entry and exit points marked and ensure that all of the security personnel that will be working during your event are aware of these areas as well as the areas prone to overcrowding. Massive events that go on for multiple days can have thousands of attendees. It isn’t plausible to do a background check on every ticket buyer. There are some steps you can take to identify attendees that are bigger risks. Before the event, pay attention to guests that purchase event tickets in bulk. At the event, ensure that security is on the lookout for suspicious behaviour. Some signals to note include attendees that are consistently watching security and staff, attendees that don’t seem to be engaging or have a forced interest in the event, and attendees that appear to be surveying the layout of the event. Every staff member should be connected in real-time either through a radio or a walkie-talkie with the hired security guard or security team. It is up to both parties to communicate with each other if they spot any suspicious activity. For the safety of event managers and event staff, any peculiar activity should be reported to security and direct confrontation should be avoided. To assist with better communication, event planners and managers can provide security beforehand with the logistics of the event so the security team has an idea of where event staff will be. Events should be a fun experience for both attendees and the planners. 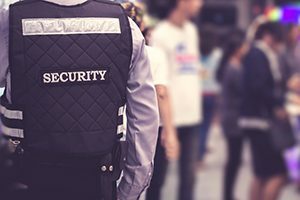 Minimize the stress of handling security by hiring an experienced event security company that can assist you with the pre-event strategy, execution, and post-event watch. At Impact Security Group, we can provide you with experienced personnel to handle all of your event security needs, no matter how big or small your event. Contact us today for more information.